St. Stephen's Episcopal Church, Edina, MN . XVIII.21-25, 30-34, 36, 41-42, 45-49; XVIX.2, 11; Tatian's Diatessaron (c. 150-160). "To run over it briefly: by the five loaves are understood the five books of Moses; and rightly are they not wheaten but barley loaves, because they belong to the Old Testament. And you know that barley is so formed that we get at its pith with difficulty; for the pith is covered in a coating of husk, and the husk itself tenacious and closely adhering, so as to be stripped off with labor. Such is the letter of the Old Testament, invested in a covering of carnal sacraments: but yet, if we get at its pith, it feeds and satisfies us." "But why did He ascend after He knew that they wished to seize Him and make Him a king? How then; was He not a king, that He was afraid to be made a king? He was certainly not such a king as would be made by men, but such as would bestow a kingdom on men." "The Feeding of the 5,000," John 6:5-14, Martin Luther, c. 1525. "They that follow Christ sometimes hunger, but they are never without help." "Observe the effect this miracle had upon the people. Even the common Jews expected the Messiah to come into the world, and to be a great Prophet. The Pharisees despised them as not knowing the law; but they knew most of Him who is the end of the law. Yet men may acknowledge Christ as that Prophet, and still turn a deaf ear to him." "Jesus saith to Philip - Perhaps he had the care of providing victuals for the family of the apostles." "passover . . . was nigh--but for the reason mentioned (Joh 7:1), Jesus kept away from it, remaining in Galilee." "The miracle of the Feeding of the Five Thousand, which follows, is the only miracle of the Savior recorded by all the four Gospels." Commentary, John 6:1-21, Craig A. Satterlee, Preaching This Week, WorkingPreacher.org, 2015. "While Moses is God's greatest prophet and lawgiver, Jesus is God. Stated another way: Whoever your -- whoever our -- Moses is, Jesus is mightier. Jesus is more." "Visible Words," David Lose, ...in the Meantime, 2015. "It's not what we want to hear, really, but there it is all the same. The sacraments tell us first the difficult truth about ourselves, and only then tell us the glorious truth about God's loving response to us and abiding concern for us." "Bread of the Preaching Life," Karoline Lewis, Dear Working Preacher, 2015. "Come to the Feast," David Sellery, 2015. "Jesus and the Feeding of the 5,000 and a Man Named Karl," Janet H. Hunt, Dancing with the Word, 2015. "Who do you relate to in this story? Philip? Andrew? The boy? Someone in the crowd? How does where you enter the story impact your understanding of the meaning of Jesus feeding the 5,000?" "Seeing through Fog," Thomas Beam, 2015. "So What Did He Do on that Mountain?" Stan Duncan, If You Lived Here, You'd Be Home By Now, 2015. "Fragments," Nancy Rockwell, The Bite in the Apple, 2015. "Bugs at the Picnic," Lynn Miller, Art & Faith Matters, celebrating our creative and living God by generating art and architecture resources for congregations and individuals. Art and Faith Matters facebook page contains additional resources. "Signs for the Sick," Andrew Prior, First Impressions, One Man's Web, 2015. "A Hard Wind Blows," Howie Adan, Just off the Map, 2015. "Help Me Lord. You're My Only Hope," Porter C. Taylor, The Liturgical Theologian, 2015. Commentary, John 6:1-21, Ginger Barfield, Preaching This Week, WorkingPreacher.org, 2012. "Perhaps we can move through these texts, allowing for the bread metaphor to hold them together, but not getting blocked in our interpretations by the dominance of the loaf." Jesus Feeds a Large Crowd, Then Walks on Water, audio telling, story in episodes, graphic, audio and written commentaries. Go Tell Communications, Biblical Storytelling for the Global Village, 2012. "Five Barley Loaves," Glenn Monson, Law and Gospel Everywhere, 2015. Lectionary Greek, John 6:1-21, Rob Myallis, 2012. "Bread of Life Sermon Series," David Lose, Working Preacher, 2012. "Catering Our Fears," Peter Woods, I Am Listening, 2012. "Shine a Light," Neil Chappell, a weird thing, 2012. "Bread, Water, and Signs of God," Sharron R Blezard, Stewardship of Life, 2012. "On Barbeque Grills and a Boy's Lunch," Janet Hunt, Dancing with the Word, 2012. "Some prefer to think of it as a kind of supernatural miracle.. Others insist it would be as much of a miracle if, following a child's example, everyone simply put on the table what they had brought... In a world where we are all too quick to hold tight to what is 'ours' and awfully slow to share, the latter would seem to be as miraculous an event as any." "Gathering the Fragments," Jan Richardson, The Painted Prayerbook, 2012. Use of images. "It is part of the miracle: how Jesus, with such intention, cares for the fragments following the feast. He sees the abundance that persists, the feast that remains within the fragments." Commentary and Reflections, Stan Duncan, If You Lived Here You'd Be Home by Now, 2012. "...Jesus is also not just symbolically being the new realm of God embodied on earth, he is modeling a way to create it." The Politics of Breaking Bread, Rachel Mann, Political Theology, 2012. "Jesus invites us to gather up the fragments. For it is part of the nature of broken bread that fragments will fall. Yet, at heart of Jesus’ economy is the desire that nothing that matters – that might actually feed us – should be lost." "All the Water in the Oceans," Katie Munnik, Presbyterian Record, 2012. "John 6:1-21 and mourning Aurora." Holy Textures, Understanding the Bible in its own time and in ours, John 6:1-21, David Ewart, 2012. "These stories try to open our eyes, hearts and minds to see the hidden truth that is in plain sight. They are trying to train us so that we too can SEE where is the bread of life. ... So that we can SEE Jesus and welcome him into our frail boats on the stormy sea." "Loaves and Fishes," Lisa Ann Moss Degrenia, 2012. "Beyond Bread and Kingdom," Andrew Prior, 2012. John takes the story of the feeding and says Jesus is profoundly more than a provider of bread. "Jumping to Jesus," Rick Morley, 2012. "Would you follow Jesus even if he didn’t do cool stuff?" "Mind the Gap," Alyce M. McKenzie, Edgy Exegesis, Patheos, 2012. "In between 'Here is what little we have' and 'Here are the 12 baskets of leftovers,' there is the Jesus factor." Comentario del Evangelio por Ofelia Dávila Llimpe, Juan 6:1-21, Working Preacher, 2012. Commentary, John 6:1-21, Brian Peterson, Preaching This Week, WorkingPreacher.org, 2009. "The feeding of the multitude is the only miracle story told in all four Gospels." "First Thoughts on Year B Gospel Passages in the Lectionary: Pentecost 9" William Loader, Murdoch University, Uniting Church in Australia. "For many who are sensitive to world poverty and disaster the images of multiplying food or walking on water are painfully unreal, almost a cruel fantasy." "Bones: A Reflection on John 6:1-21," poetry by William R.G. Loader, Murdoch University, Australia. Exegetical Notes by Brian Stoffregen. "What type of "savior" do we try to make Jesus? Is it Jesus' "job" to completely take care of us -- like a king for his subjects? Is it Jesus' "job" to leave us alone so that we can do whatever we want?" "Want More!" Marcus Felde, Sabbatheology, The Crossings Community, 2009. "And what is the Life we now live who have eaten of the Bread of Life?" "Five Loaves and Two Fish, Walking on Water," Gospel Analysis, Sermons from Seattle, Pastor Edward F. Markquart, Grace Lutheran Church, Seattle, Washington. Detailed background and exegesis. 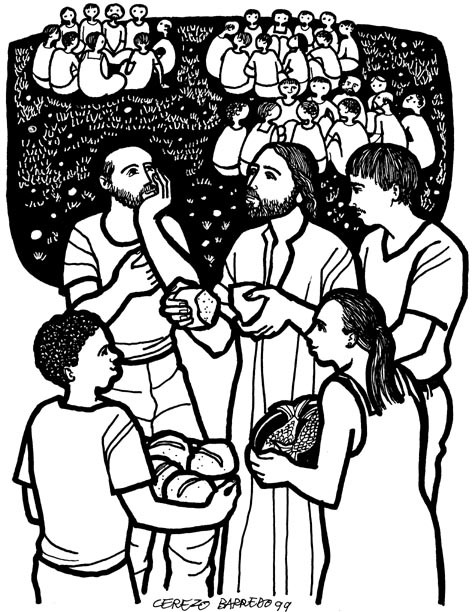 10th Sunday after Pentecost, John 6:1-71 -- The Bread Which Gives Life to the World, Paul S. Berge, Word & World Texts in Context, Luther Northwestern Theological Seminary, 1985. Join the Feast, John 6:1-21, Luke Schlimme, Union PSCE, 2009. "In this text we see an interplay taking place between Jesus? grace and his glory." Wellspring of the Gospel, Ordinary 17B, Catherine McElhinney and Kathryn Turner, Weekly Wellsprings. "The Gift of God," Ordinary 17B, Larry Broding's Word-Sunday.Com: A Catholic Resource for This Sunday's Gospel. Adult Study, Children's Story, Family Activity, Support Materials. "What do you most appreciate in your life? How hard did you work for those items or qualities? Do you deserve those items or qualities?" "Israel's Hour of Decision (John 6)," by Robert Deffinbaugh at the Biblical Studies Foundation. "Jesus had sought retreat from the crowds, due to their heightened messianic expectations, but instead they gathered about Him, and now He performed this miracle which further added fuel to the flames of their hopes for Messiah. It was difficult enough to deal with the crowd alone. His disciples (with their own messianic hopes running high, perhaps higher than the crowd?s) would have only made matters worse." "Note that the fish mentioned previously (in 6:9) are not emphasized here. This is easy to understand, however, because the bread is of primary importance for the Evangelist in view of Jesus' upcoming discourse on the Bread of Life." "The Messiah: Mightier Than Moses (John 6:1-21)," by Robert Deffinbaugh at the Biblical Studies Foundation. "The main thrust of this chapter is our Lord?s ?Bread of Life? discourse, which is occasioned by the miracle of the feeding of the 5,000. John records this miracle because it is the setting for what takes place in the remainder of the chapter, much like the healing of the paralytic sets the scene for the rest of chapter 5." Bailey, Raymond, "John 6," Review and Expositor, 1988. Harm, Rudolph H., "4th Sunday in Lent," Concordia Journal, 1985. Hoffman, Charles, "More than Enough," The Christian Century, 2006. Kim, Stephen S., "The Christological and Eschatological Significance of Jesus' Passover Signs in John 6," Bibliotheca Sacra, 2007. Lamar, William H., IV, "Chasing Jesus," The Christian Century, 2003. Manus, Chris U., "John 6:1-15 and its Synoptic Parallels: An African Approach toward the Solution of a Johannine Critical Problem," Journal of the Interdenominational Theolocial Center, 1991-1992. Naranjo-Huebl, Linda, "'Take, Eat': Food Imagery, the Nurturing Ethic, and Christian Identity in The Wide, Wide World, Uncle Tom's Cabin, and Incidents in the Life of a Slave Girl," Christianity and Literature, 2007. O'Day, Gail R., "Between Text and Sermon: John 6:1-15," Interpretation, 2003. Shoemaker, H. Stephen, "Bread and Miracles," The Christian Century, 2000. Throckmorton, Burton Hamilton, "Language and the Bible," Religious Education, 1985. Witkamp, L.Th., "Some Specific Johannine Features in John 6:1-21," Journal for the Study of the New Testament, 1990. "More Unexpected Jesus," the Rev. Sharon Hiers, Day 1, 2009. "Plenty of Grass," Pentecost 8, 30 July 2006, David Zersen, Göttinger Predigten im Internet: Every Sunday Sermons based on the RCL by a team of Lutheran theologians/ pastors. "More than Enough," the Rev. Dr. Ozzie E. Smith, Day 1, 2006. "Five Loaves and Two Fish to Feed 5,000," "Walking on Water," Pastor Edward F. Markquart, Grace Lutheran Church, Seattle, Washington. "Getting the Sand out of the Gears," the Rev. Dr. William L. Self, Day 1, 2006. "Living Loaves," the Rev. Debra Metzgar Shew, Day 1, 2003. "A Picnic on the Mountainside," the Rev. Grace Imathiu, Day 1, 2000. "There's No Fear in Jesus," Charles Kirkpatrick, Sermons4kids.com. "Feeding the 5000," children's study, puzzles, coloring sheet, etc. Higher Praise Christian Center. "Sharing What We Have," Mike Perks, sermons4kids.com. "Five Loaves of Bread and Two Fish," from A Certain Jesus by Jose Ignacio and Maria Lopez Vigil. Ideal for catechetical and liturgical dramatization of today's gospel. "Feeding the Crowd," Penny Hewlett, Drama Southwest. "When a Little Is a Lot," Nina Wallestad, Dramatic License. Conditions of Use. "The Boy and His Lunch," monologue, Ross Olson. Clip Art, John 6:13, Fr. Richard Lonsdale, Resources for Catholic Educators. Clip Art Images: John 6:1-15, Misioneros Del Sagrado Corazón en el Perú. John 6:1-15, at Cerezo Barredo's weekly gospel illustration. Liberation emphasis. Clip Art: Jesus Walking on Water, Feeding the 5000, Julius Schnoor von Carolsfeld woodcuts, World Mission Collection, Wisconsin Evangelical Lutheran Synod. "Where Is Bread?" original hymn by Carolyn Winfrey Gillette, tune: ABBOT'S LEIGH 8.7.8.7.D ("God Is Here!"). Hymns with Scripture Allusions: John 6:20. The Cyber Hymnal.